Vintage Riggen Industries "Ice Truck"
Riggen Industries produced model number HR-6 "Hot Rod Ice Truck" as part of it's Hot Rod Series. Here is a new in box example. The car has never been run, it is in the proper yellow Hot Rod style box, labelled properly and includes the instruction sheet. This car DOES have grill lines. It is on the later "dropped" chassis. Lancer produced an HO Scale T Wagon #261. The 200 series indicates a wider body than the 700 series. The NIB Lancer bodies that I have do not have grill lines. See one Lancer body listing here.... 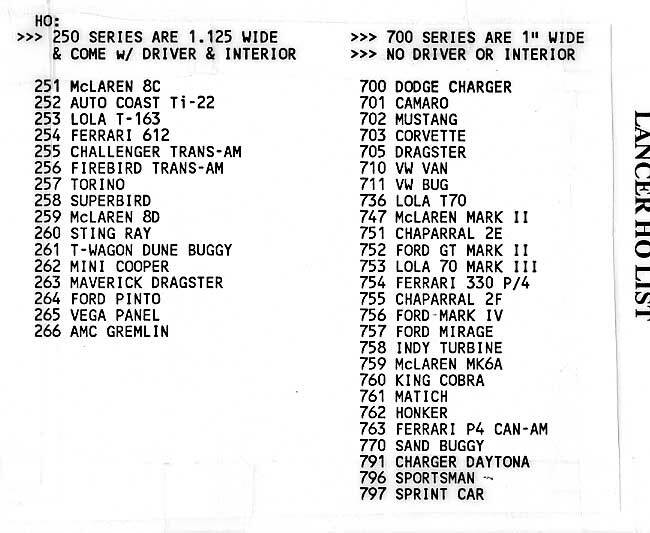 Note on the Lancer list that #261 is called the T Wagon Dune Buggy! This isn't the only difference I noted between the two bodies, please see pictures below. In addition to the grill lines on the DEFINITE Riggen version, there is also a center hood line. Below is a picture of three bodies that I have in my collection. The top two both have grill lines and the hood "crease". The one with the wood grain decal has a smooth front and no center crease. as seen from their underside...note the cobra clip! than the "normal" trim lines on the Lancer body. All other aspects of the body appear to be identical. even done by Lancer for Riggen will probably never be known. None the less, these are both period bodies, not that easy to find, and make for a cool truck.